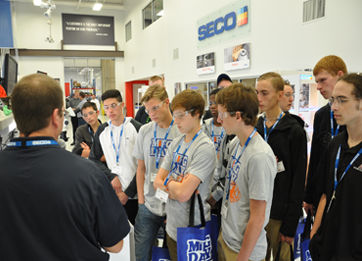 Committed to working with local schools to generate interest in manufacturing careers, Seco Tools welcomed 170 Detroit Metro high school students to the company’s North American headquarters in Troy, Michigan, on Friday, October 2 for National Manufacturing Day 2015. Seco partnered with MSC Industrial Supply for the event, which highlighted the diverse job options available within the manufacturing industry. Organized by the National Association of Manufacturers, Manufacturing Day is a celebration of modern manufacturing meant to inspire the next generation of manufacturers. It occurs annually on the first Friday in October. This year’s Manufacturing Day included 2,397 events hosted throughout the United States, Canada and Mexico. Students attending Manufacturing Day at Seco selected from a variety of breakout sessions highlighting unique careers, including IT, engineering, CAD, distribution, production and sales. Industry experts and college advisors were on hand to meet with students and answer questions about these career paths. Students also received a tour of Seco’s technical center and world-class custom tool production facility. Demonstrations of CNC machining and 3D printing equipment provided students with a snapshot of the latest technologies used in today’s manufacturing industry. According to results from a skills gap study released earlier this year by the Manufacturing Institute and Deloitte, over the next decade nearly 3.5 million manufacturing jobs likely need to be filled. The skills gap, caused in part by an anticipated increase in manufacturing jobs due to economic expansion and baby boomer retirements, is expected to result in 2 million of those jobs going unfilled. Seco Tools, LLC is a leading provider of metalcutting solutions for milling, turning, holemaking and toolholding. The company prides itself on building close relationships with customers to effectively understand and address their needs. MSC Industrial Supply Co. (NYSE:MSM) is a leading North American distributor of metalworking and maintenance, repair, and operations (MRO) products and services. We help our customers drive greater productivity, profitability and growth with more than 1 million products, inventory management and other supply chain solutions, and deep expertise from more than 70 years of working with customers across industries. Our experienced team of over 6,500 associates is dedicated to working side by side with our customers to help drive results for their businesses – from keeping operations running efficiently today to continuously rethinking, retooling, and optimizing for a more productive tomorrow.